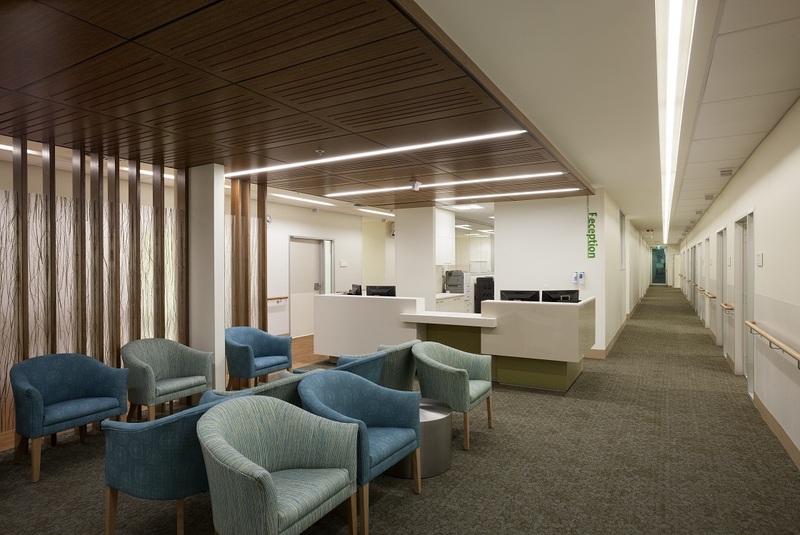 The recently completed Olivia Newton-John Cancer and Wellness Centre in north-east Melbourne is a holistically responsive design solution to the varied and intricate facets of cancer care. Founded by Olivia Newton-John, herself a high-profile cancer survivor, Olivia brought her own understanding and experience of patients’ needs to the design of the centre and — working with Jackson Architecture and McConnel Smith & Johnson — wanted to provide a healthy, productive, safe and healing environment for patients, their families and staff from the ground up. Enhancing the axial geometry of the centre’s design, the flooring was used to identify the various functional aspects occurring within the facility. Complementing the natural floor finishes of timber and stone, a selection of Shaw Contract Group’s GECA certified EcoWorx carpet tile was used including Casco, Whatnot and Cashmere. The materials had to be sustainable, have low toxicity and low embodied energy to be specified for the project while the maintenance and life cycle of the materials was also considered in conjunction with their ability to withstand the demands of the space it was being used in. Our GECA certified EcoWorx carpet tiles ticked all the boxes,” says Allison Trebilcock, specification consultant at Shaw Contract Group. Certified with the highest level of GECA certification and a Green Star Level A product rating according to the Green Building Council of Australia, EcoWorx carpet tiles are 100 per cent PVC free and are backed with an environmental guarantee for reclamation and recycling. We chose to get GECA certified because people are demanding sustainable products and here in Australia GECA helps demonstrate our commitment to sustainability. This design focused product is also durable and low-maintenance enabling it to withstand the unique demands of a healthcare environment. Shaw Contract Group’s EcoWorx carpet tiles contributed to the general relaxed, non-institutional environment that was achieved for the centre.